32% follow-on formula (skimmed milk*, maltodextrine*, vegetable oils* (palm**, rapeseed*, sunflower oil*), partly demineralised sweet whey powder*, skimmed milk powder*, sweet whey powder*, calcium phosphate, vitamin C, vitamin E, iron pyrophosphate, zinc sulphate, niacin, calcium D-pantothenate, sodium selenite, vitamin A, vitamin B1, vitamin B6, potassium iodade, folic acid, vitamin K, vitamin D), 27% wholegrain oat flour*, maltodextrine*, skimmed milk powder*, partly demineralised sweet whey powder*, fructose, starch*, 3% apple powder*, calcium carbonate, natural apple aroma, vanilla exract, bifido bacteria cultures (B. breve, B. bifidum, B. infantis, B. longum), Vitamin B1, Vitamin A, Vitamin D.
All ingredients for Töpfer's organic gruels and porridges are made with selected ressources from organic farming. The cereal in organic gruels is produced through an especially mild procedure which makes it easily digestible and perfect for babies. The most valuable nutrients of the seedling are largely preserved. 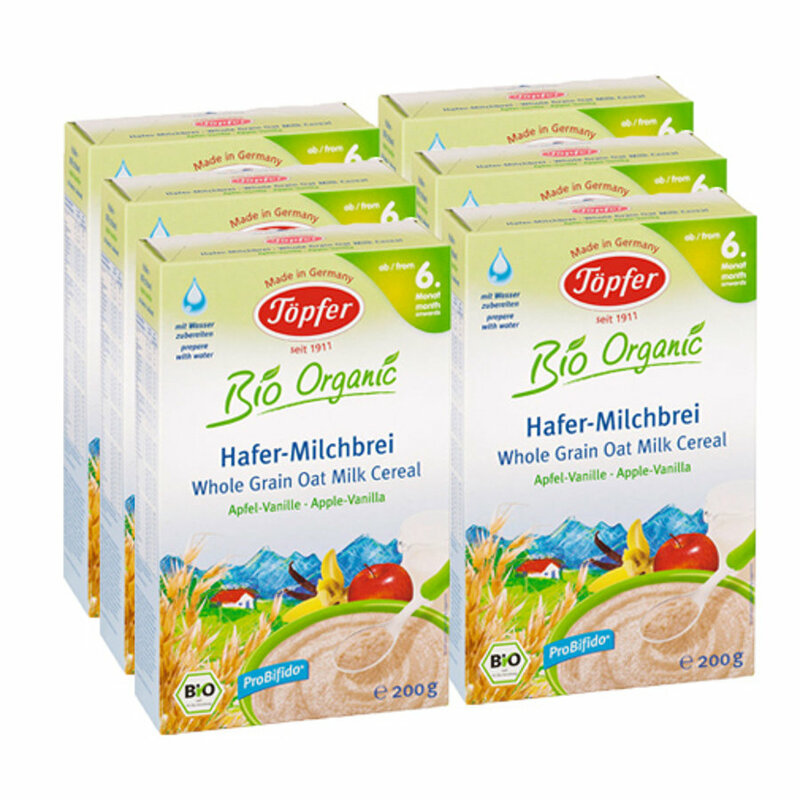 Töpfer gruels and porridges are therefore especially easily digestible for your baby. For a balanced diet and a healthy development of your baby.